How to trace email address?? The objective of this post is 'how to trace any email address'? I'm not going to talk about email-clients(outlook,bat,etc) because, it won't let us see more than what we see. Rather i will be writing about web-based email address. I've email addresses on hotmail,gmail and yahoo. I shall be discussing about what i know. 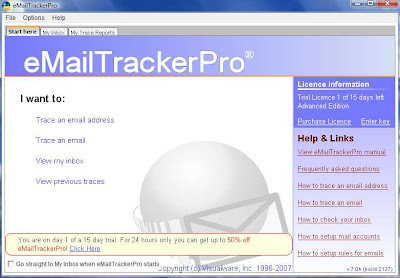 How to trace email address(Gmail,Hotmail,Yahoo)? Tracing email address was not that hard before but these days, it's some what restricted for normal eyes. The reason, it's restricted because, so many abusers started to abuse the header(what is header information, please read below) informations of emails and it was also the privacy leak since expert email-readers could figure out whereabouts of email senders. Well, still i can find all whereabouts of email senders. Email headers are some lines made up of some strange details regarding the servers they(emails) pass through on and on till the email is delivered to recipients. If you check carefully inside email clients, you can find some of this header informations too. Some people tends to bother people in emails. If you could find the whereabouts of Sender, you could take some actions against him/her. You can file an abuse report or something like that. You can see his/her ISP where you can give a call to or send email. 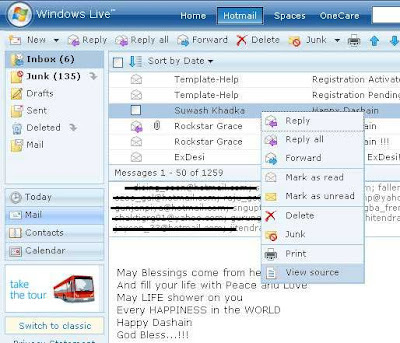 Lets enable email header information in msn Hotmail. 1. Go to Hotmail Option. If your hotmail interface is Full Version, no problem. If your hotmail interface is using Classic Version, you'll see something like below. Change the Classic version to Full Version by clicking the link 'Try the full version'. NOTE:Classic Version is dialup friendly whereas, Full version utilizes high speed internet,broadband friendly and only it reveals the header information. So enable Full version, no matter what. To see the header information, right click the email and select the 'View Source' option(see the figure above). The next popup window shows all the header information like below. Lets enable email header information in google GMAIL. 1. Go to Gmail inbox, and open one email. Once the email whose headers you want to see, is opened, check dropdown icon at the top-right of the email, next to the reply button. click there and some menus will come. From there,select 'Show Original'. 2. A new popup window Will launch containing all the header informations of the email. 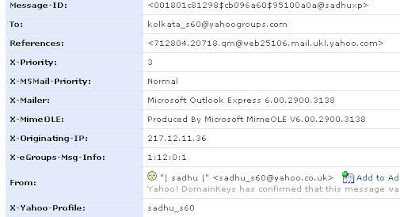 Lets enable email header information in YAHOO MAIL. 2. Now, when someone opens the yahoo mail, checks his/her email, he/she will notice this header informations just above their main email message. THAT'S IT FOLKS. THAT'S HOW WE ENABLED HEADER INFORMATIONs on MOST POPULAR WEB MAIL services. NOW, HOW DOES HEADER INFORMATION WORK? HOW IS IT CREATED? 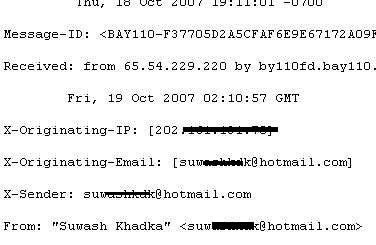 Just for an example,here, a sender(who is student of Kathmandu University) is using his/her university's computer lab(lab.ku-university.edu) to send email to his colleague(colleague has wlink email address ending at something@wlink.com.np). Now, he/she writes mail at his university computer, he/she sends the mail and the mail is passed to university's mail server called mail.ku-university.edu. The mail server then checks the delivery email address. It finds it as wlink('ISP' in this case) mail server i.e mail.wlink.com.np .It contacts the wlink mail server and delivers the email to it. The mail is now stored on wlink's mail server until the receiver logs in to check his/her inbox. - When sender writes and sends mail using the email client. The following header will be created. This above header is generated by senders Email client. - When mail.ku-university.edu transmits the email message to mail.wlink.com.np The following header will be created and added. This above header is generated by Senders Mail server. 3. ISP or (receiving) mail server -----> Stores mails to it's Local server. - when mail.wlink.com.np stores the message on it's server for the receiver. The following header will be created and added. 4. Finally, when receiver downloads his email from his local home machine, another header will be created and added. Now, we've seen how to find and read the header information. If you see carefully, observe the header information, you will be able to find the originating IP. That's the senders real IP address and thats from where, the sender has got his/her email sent. If you get the IP of the sender, search http://www.arin.net/ or http://www.dnsstuff.com for more informations about the sender. Yesterday, i got a comment from Anup and that really shook me up. That's true, we can't get an IP in anyway when someone gmail user sends email to anywhere. Gmail has tightened it's many of the features from normal prying eyes. Besides, the rendering of Gmail inbox differs from browser to browser. I checked my Gmail/hotmail/yahoo inbox on 4 different browsers including Firefox,Internet Explorer, Opera and Safari. There was no use of using other browsers based on any of these 4 browser engine. My conclusion is It really made difference while using those online mail services from browser to browser. It's easy to trace hotmail and yahoo emails however Gmail mails have become untraceable for some reasons. One can,of course,trace an email in Gmail Inbox if the sender is Yahoo or hotmail users. For some people who are scared of trying to find what all those headers really are or never cared to bother about those headers to understand, there is a nifty tool for download. EmailtrackerPro 2007 is an excellent product of it's kind. Download it here.It has 15 days unobstructed trial periods. 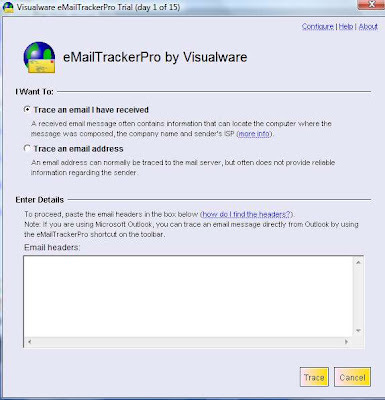 EmailtrackerPro 2007 can trace the email eitherway. We just have to feed it with the header details or email address. It's not a good idea to feed it with something@hotmail.com and try to trace the user. It'll always show up as some server located in USA. My best bet would be to get the header details(follow my tutorial how to get header details above) and feed that header info to this EmailTrackerPro 2007. You'll be amazed to see how it traces the email sender. 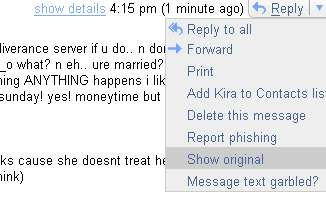 Oh I had somehow turned on this feature in my hotmail and I did not know what it was. Tesaile k k dekhauney raicha mero email ma. can u explain how can i trace email sent from/or received by gmail? I think gmail do not send origination ip address. Ashish bro, we can have general ideas about what those headers really are . The details on last on the mail headers mostly reveal the senders information. Anup, sad to report, you are right, previously, it was only with Gmail to Gmail and i just check Yahoo to Gmail, the IP is not revealed. We must not forget,things keep changing. Few months ago, Gmail allowed me to see the originated IP, now, it's showing all IPs from gmail servers only and rest are masked. Not really masked but abbreviated into something indistinguishable. But the right is solely limited to Gmail to read the originating IP. I'll put more information on this regards in coming days. There are also websites that can be used to trace email to the source IP address. True, mail originating from gmail cannot be traces as Google does not include the source IP address. What you are reading is their SMTP server address. Not the IP of the senders.